Nature's Life's K-2 5,000 mcg contains vitamin K2 in it's menatetrenone form. Warnings: If you are taking blood-thinning (anticoagulant) medications, use this product only under the direction of your doctor. Notes: Contains no ingredients other than those listed on this label have been added to this product. Suitable for vegetarians. 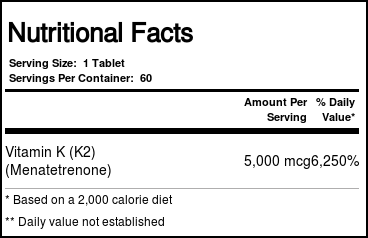 Recommended Use: Take 1 tablet daily with food. 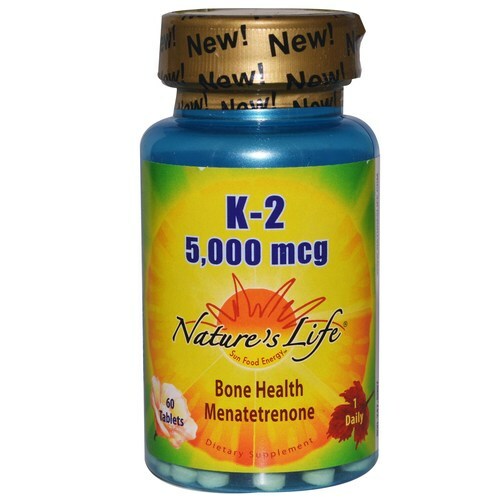 The customer reviews posted below are based on individual consumer experiences and may NOT necessarily represent what expected results will be from using or taking Nature's Life K-2 5-000 mcg - 60 Tablets. These results may not be typical and you should not necessarily expect to receive the same results. Actual results may vary. I started taking the high mcg vitamin K for diabetes. We'll see what happens.